Fishermen say that they found the 40-foot-long dead shark in the Arabian Sea near Karachi. The whale shark carcass being lifted by crane in Karachi yesterday. 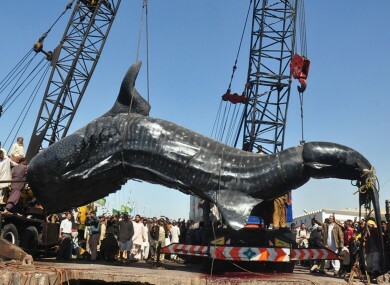 A 40-FOOT-LONG dead whale shark has gone on display in Karachi, Pakistan after being taken from the Arabian Sea nearby. Hundreds of people gathered along the pier to watch the whale shark, so named because it is the largest of sharks, being hoisted onto the shore. Fishermen say they found the already-dead shark in the sea. Dawn reports that a local man says he and his friends clubbed together to buy the huge fish for just over €1,600 to show their appreciation to the fishermen who caught it. Haji Qasim says he has permission to keep the fish on display for three days and then plans to sell the meat. The World Wildlife Fund says that the species is listed as ‘vulnerable’ by the International Union for Conservation of Nature. Although sightings of the whale shark in the wild are extremely rare, Australia is one of the best places to spot it. The species is also listed as ‘vulnerable’ on Australia’s Environment Protection and Biodiversity Conservation Act 1999. Email “In pictures: whale shark displayed in Pakistan”. Feedback on “In pictures: whale shark displayed in Pakistan”.